In today’s world we don’t use the word “steadfast” often, partly because we live in a throwaway society. Cars, appliances, clothing, relationships just aren’t built to last. No one wants to take the extra effort, or they are too selfish and greedy and only want to heap to their own lusts. They have the technology to build things to last virtually forever, but then they would only sell one. So they make them to fall apart in a few years so that a new purchase will be made. We have the grace and strength from the Lord to make relationships work, however very few people want to stick it out. Steadfast. It means faithful, committed, devoted, and according to Webster’s it means, “firm in belief, determination, or adherence, and firmly fixed.” His love is steadfast. It doesn’t change. Ever. You can’t earn more and He can’t love you any less. His love doesn’t depend on performance, there is no strings attached. He is determined to love you. His love for you is devoted and faithful and fixed. Because of that great, steadfast love, we can be confident of His faithfulness. He cares and because He cares He works things out for us. His love has no strings attached; however the benefits of His love are conditional. We have to accept His love. We have to build a relationship with Him. We can’t use the worlds view or our natural experiences to try and figure out His love. We have all been hurt and disappointed in someone we loved but who used and abused us, or maybe was indifferent. A relationship with God isn’t an unhealthy attachment, or a one sided love affair. He isn’t a leach who wants to drain us dry. He wants us in relationship with Him so that we never miss out on a blessing, so that we are sure to hear His voice when He speaks to us. He wants us to spend time with Him and communicate with Him because He enjoys us. Feeling like a failure? 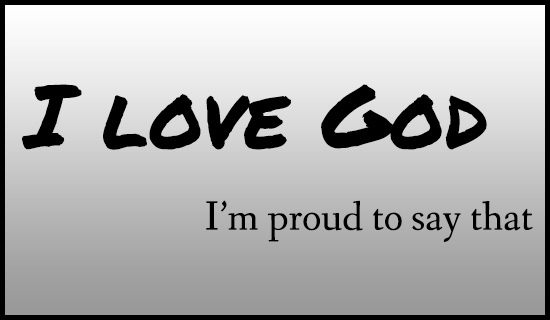 God loves you! Checkbook is on the light side? God loves you. Fighting some bug, or disease? God loves you. Family issues? God loves you. Identity issues? God loves you. This entry was posted in Thoughts and tagged God, help, Holy Spirit, hope, Jesus, love, Salvation, transformed life.